Perhaps the most popular thing to do in Yaren is to take a rip to view the relics of the Japanese occupation of Nauru. Scattered around the fields you can spot the remains of Japanese bunkers, guns and pillboxes that were in use during WWII. The second must-see in Yaren are the Moqua Caves. These caves are the largest on the island and are a series are tunnels that are found near an underground lake. The lake is known as the Moqua Well and it is Nauru’s most important source of freshwater. The phosphate mines in the uninhabited interior of Nauru, used to form the backbone of the island’s economy. Since the sharp decline in demand at the end of the 20th century, the mines began to close the area has become the most striking part of the island. Enormous coral pinnacles, some exceeding 15 meters, remain standing. The quarry itself is now an enormous labyrinth which is reminiscent of the surface of the moon. Enjoy a ride around Nauru. Hitch a ride to drop off wherever you want to visit or catch a bus around the island. It takes less than an hour to drive around. Capturing variety beautiful things around Nauru. The national sport of Nauru is Australian Rules football. There is a 12 team league on the island and the games have a huge spectator base. You will find them played on Saturdays at the Linkbelt Oval Sports Field. Historically, Culture sports played by the Nauruan remains are Wrestling, Stick throw game, Ball game, Canoe and Frigate bird. The KEBORARO, Fire throwing game is far too dangerous and no longer exist. Other international games were added to Nauru national game including the AFL, Powerlifting, Weightlifting and others. All games practices the same Nauruan taboo KAMADU. Failure to do will lead to their defeat. Challengers and components proudly represent their home colors from their constituencies. Anibare Bay is perhaps the most beautiful, tropical beach in Nauru. The white sand stretches for more than a mile along the coastline. Be careful though, the beach is not ideal for swimming as there are strong undercurrents which can be dangerous. Don’t be fooled by the name, this is not a harbour at all. In fact, it is the best and the main swimming spot on the island. Explore world war relics and take a hike with the local Nauruans and spot the Japanese remains from WW2. Also discover hole in the walls at Anabar. Imagine the Nauruan lives in the past, hiding away in a hole, a meeting place for the tribes. Nauru has always been known to be situated in one of the best fishing grounds on earth. 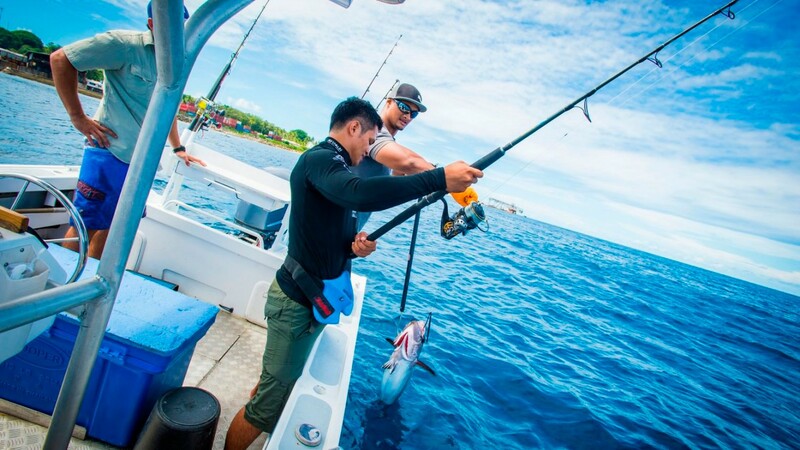 Game fishing is a popular sport and pastime in Nauru, so discover your own new experience and head out on one of the local boats to discover your new experience and catch your own yellow fin tuna, marlin, sail fish, and many more. Snorkelling and diving is common in Nauru. Fishing is a way of supporting a family with food, or if there's any boredom, just wear your snorkelling gears and head out to the sea, to discover and enjoy catching different kinds of fishes just beneath the surface, away from all the stress. Also experience deep diving in the blue which even our ancestors have never been to. Command Ridge is a spectacular look-out point, from here you can see the entire country. It is also where the Japanese stood guard over Nauru during WWII. Walk up the ridge have a look at the communications bunker as well as two six-barrel guns that remain to this day.